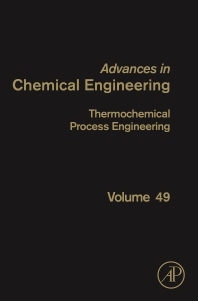 Thermochemical Process Engineering, the latest edition in the Advances in Chemical Engineering, provides up-to-date information, comprehensively presenting updates in a systematic fashion that has made the series of great importance to organic chemists, polymer chemists, and many biological scientists since its inception in 1960. The series includes contributions from established authorities in the field who combine descriptive chemistry and mechanistic insight to create an understanding on how the chemistry drives the properties. Kevin Van Geem (associate professor) is member of the Laboratory for Chemical Technology of Ghent University. Thermochemical reaction engineering in general and in particular the transition from fossil to renewable resources are his main research interests. He is a former Fulbright Research Scholar of MIT and directs the Pilot plant for steam cracking and pyrolysis. He is the author of more than hundred scientific publications and has recently started his own spin-off company. He is involved in on-line and off-line analysis of complex petrochemical and biochemical samples using comprehensive two-dimensional gas chromatography. Pyrolysis, detailed kinetic modeling, process, scale-up, modeling, and ant-fouling technology belong to his main expertise.